Hello everyone. 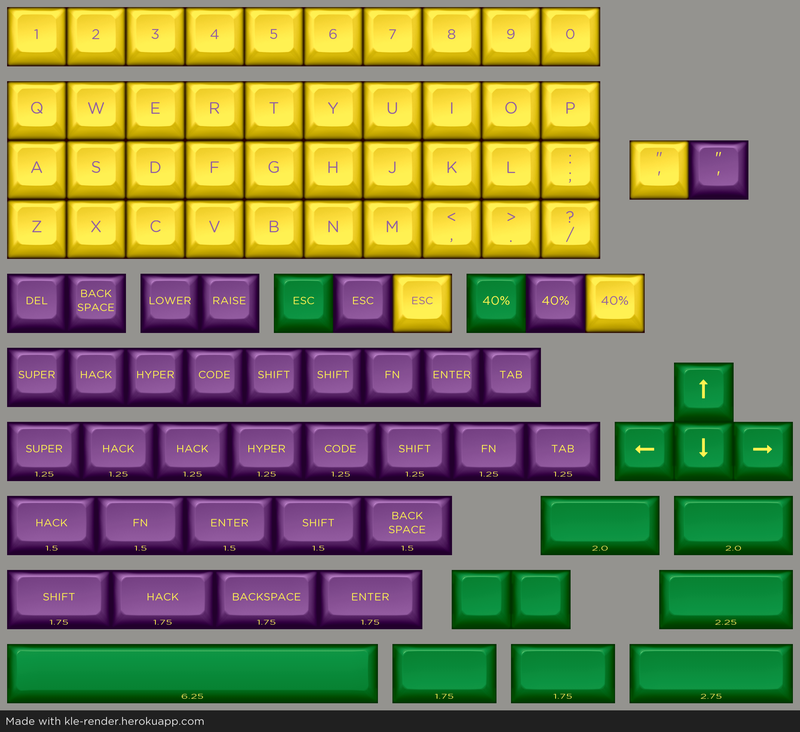 Here is the final draft of DSA Mardi Gras. Many of you are probably unaware of the 40% Keyboard Discord (https://discord.gg/HydeZT2), but we are a community of keyboard enthisiasts devoted to sub-60% keyboards. DSA Mardi Gras is a personal project of mine with the purpose of sharing the New Orleans tradition of Mardi Gras. 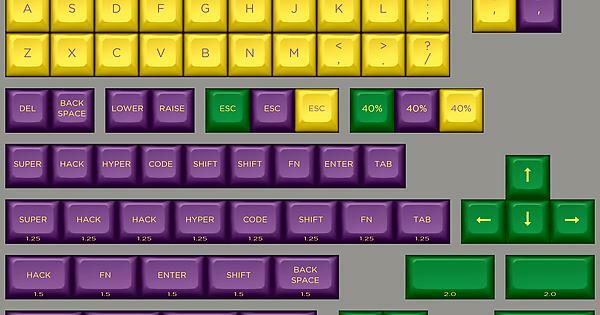 Coming from the community of 40% keyboard users, I have designed a keyset that is focused on providing coverage for major sub-60% keyboards such as the Prenonic, Planck, Minivan, JD40, JD45, Vortex Core, Pearl, THE50, Daisy, as well as others. This project was incubated on the 40% keyboard Discord and I will soon be launching a group buy in the coming days. We are a group of passionate keyboard lovers and invite you to join in on the coversation on Discord. All are welcome, so bring your love of keyboards and join us. 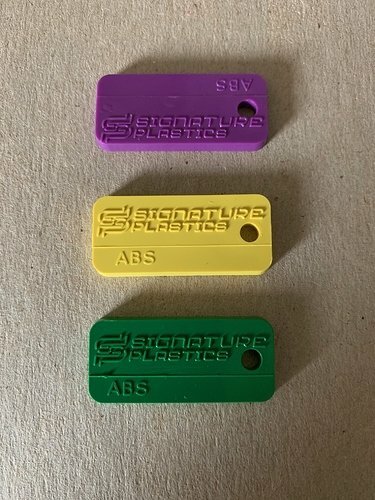 DSA Mardi Gras will be run through Signature Plastics using their awesome ABS 2-shot process in the beautiful colors of RDA (purple), VCS (green) and YY (yellow). The kit is currently locked and a price quote has already been obtained from SP. The group buy is planned to start Monday March 25th and will run for 3 weeks (or possibly 4 if time is needed to reach MoQ). Manufacturing lead time is estimated to take 10-12 weeks and shipping will commence thereafter. This should put shipping in the latter part of July (but hopefully sooner). More accurate pricing will be announced soon, but expect this set to ship for under $100 shipped CONUS and an initial MoQ of 50 sets!! International shipping will be available as well. In the meantime, here is the kit and examples of how it will look on various 40% keyboards.